Popular historic sites such as Millennium Park and Pleasant Home are in your itinerary. 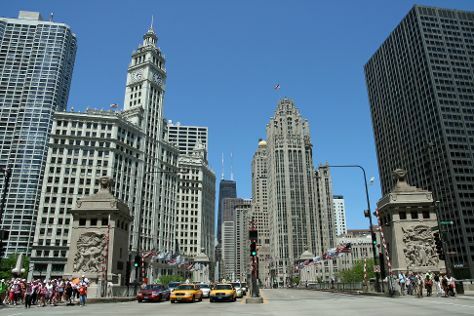 Shop till you drop at The Magnificent Mile and Wicker Park. Venture out of the city with trips to Saint Joseph (Silver Beach County Park, Lions Park Beach, & more), Valparaiso (Chapel of the Resurrection & The Course at Aberdeen) and Lemon Creek Winery (in Berrien Springs). Plan for a day of cool, family-friendly fun on the 14th (Wed) at Six Flags Great America. And it doesn't end there: explore the world behind art at The Art Institute of Chicago, kick back and relax at North Beach Park, tour the pleasant surroundings at Ohio Street Beach, and get curious at Museum of Science and Industry. To find other places to visit, more things to do, reviews, and tourist information, go to the Chicago online trip itinerary maker . If you are flying in from Netherlands, the closest major airports are Chicago Midway International Airport, Chicago O'Hare International Airport and South Bend Regional Airport. In July, daily temperatures in Chicago can reach 33°C, while at night they dip to 22°C. Finish your sightseeing early on the 5th (Thu) to allow enough time to travel back home.